By Matt Hinch. I talked to Yob frontman Mike Scheidt once. (OK, twice. But the second time was only for a minute or so.) We didn't even talk about Yob, or even metal really. We talked about our kids and parenting them. It was obvious to me that, as any decent parent should, Mike loves his kids. You name your band Hoth. That's from Star Wars. Okay, you've got my attention. Melodic black metal you say? I'm listening. Hard. Hoth is the product of the Seattle duo of David Dees and Eric Peters. This second album of dedication to the ultimate in nerdery is flat out fantastic. Even without the concept behind the lyrics, Oathbreaker still ranks among my favourite releases of 2014's first half. Sonically speaking, Oathbreaker takes a black metal core and fuses elements of symphonic metal, power metal and folk metal - three of my least favourite metals - but do it with such skill and earnestness that it's easy to become completely enamored with it. It's definitely a plus that there isn't even the slightest whiff of cheese. Hoth know how to work the icy atmosphere angle. Their black metal chills to the bone and is enhanced by absolutely frigid yet expansively epic melodies. Faster than light rhythms and gorgeous acoustics combine with rancorous screams and mind-boggling percussion over nearly an hour of intensely dramatic music. Their combination of second wave bleakness, Primordial grandeur and Eluvietie folkiness is no mind trick. They can really set the tone with beautiful acoustics and piano sections, pulverize with a fierce thrash attack a la Skeletonwitch, and pull a fair ambiance out of the ether. It's the way they are able to seamlessly stitch together such disparate aspects into a cohesive and catchy whole that makes Oathbreaker so stunning. So now that we know Hoth can craft epic soundscapes of Euro-flavoured epic black metal rife with immaculate melodies issued from a cold, black heart it's time to get to the lyrics. Hoth are able to take a subject like Star Wars, which could so easily stink the place up with all the power of Limburger in this context and give it a treatment that makes it even more epic than it already is. The icing on the cake is that they do it so cleverly and veiled. The story behind the concept follows Anakin Skywalker from his prophetic birth to his rebirth as Darth Vader. The thing is, at no time is there any overt mention of Star Wars. Instead it chronicles the rise and downfall of its unnamed character in a setting befitting any imagined epic. Although, Star Wars fans could no doubt be able to piece it together regardless of previous knowledge to the band's intentions. Honestly, I listened to Oathbreaker at least a half dozen times before I read the lyrics and I was already willing to bestow the rank of Master on the duo. They blew me away like the scattered ashes of Uncle Owen and Aunt Beru. Their mastery of the concept behind Oathbreaker takes it to the next level. Oathbreaker is a stunning example of what can happen when you fully commit to a vision. It takes balls to do a black metal Star Wars concept album but Hoth pull it off amazingly. 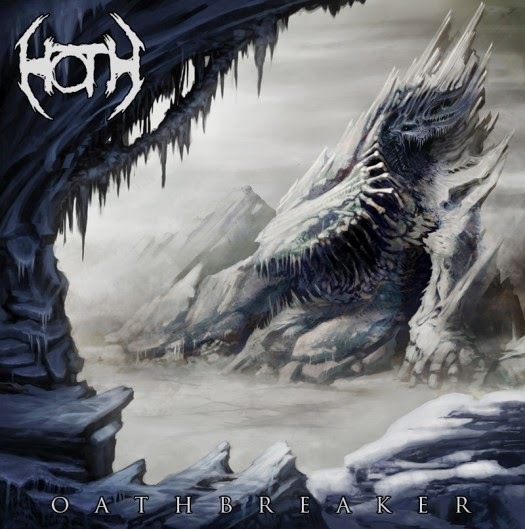 Icy blasts, relentless pummeling percussion and eons worth of epic melodies soundtracking a brilliant concept make Hoth and Oathbreaker stand out from the pack. It's worth every Galactic credit. This rips. I might have ignored this otherwise, because I've always been on Team Star Trek. The only thing more tedious to me than metal about hobbits would be metal about Star Wars. I'm on neither team. But Farscape, Babylon 5, or Firefly themed metal, now we're talking :) Some of it probably already exists, but I'm afraid to look. Mmmm...Claudia Black. Wait, what were we talking about? Lately I have not hated Star Trek. Strangely, the new movies have peaked my interest in that other Star Something. Dave's Demo Roundup Vol II.